In terms of growing audience, Twitter is a top influencer for tv ratings, according to Nielsen. By taking a look at tweets about television, astudy confirmed a relationship between Twitter and TV ratings. It also identified Twitter as one of three statistically significant variables (in addition to prior-year rating and advertising spend) to align with TV ratings. Reportedly, the recent Nielsen/SocialGuide studynoted increases in Twitter volume that correlate to increases in TV ratings for varying age groups, with a stronger correlation for younger audiences. 18-34 year olds show that an 8.5% increase in Twitter volume corresponds to a 1% increase in TV ratings for premiere episodes, and a 4.2% increase in Twitter volume corresponds with a 1% increase in ratings for midseason episodes. A 14.0% increase in Twitter volume is associated with a 1% increase in TV program ratings for 35-49 year olds, reflecting a stronger relationship between Twitter and TV for younger audiences. The study notes that the correlation is driven by the fact that consumers are regularly using multiple devices – 80% of U.S. tablet and smartphone owners who watch TV use their device while watching at least several times a month. While this is not a study about the effectiveness of Twitter for driving listening to radio, it’s certainly a trend that is worth taking note of, and it would make for a very interesting study as well. Have you registered for RAIN Summit West? One of the panels will discuss best practices for increasing your online audience and feature execs from The EchoNest, SiriusXM, ABC News and ESPNRadio. Learn more about the agenda and register here. With more than 5000 stations and 260 genres of music, Live365 may well be the most diverse streaming audio platform on the planet. Live365 offers a platform where folks who want to start their own radio station can do that for an affordable monthly fee that’s all inclusive – streaming, programming tools, royalty coverage, etc.. Monthly costs range from under $5 bucks a month for a station that you and just a few friends can listen to, to $99 or more for larger reach and even the ability to run commercials. They’ve recently upped their game by offering a new app called Studio365 that lets their broadcasters to manage their radio stations from their mobile device. Among other things, it features a nifty tool called ShoutOut that enables the capability to go “live” on the microphone whenever and wherever a broadcaster may choose. Available for iPhone and Android devices, the Studio365 mobile app lets users create, preview, and manage Shout Out voice messages, set and update station ID and pre-roll messages, update station profiles including title, image, description, review current and historical station listening stats, as well as monitor their station. While rumors of a streaming music service from Apple and Google have been prevalent lately, few expected the announcement last week that Twitter is developing a mobile music application that will let its users play and share songs. Last year, Twitter acquired the music recommendation website We Are Hunted, a site that charts the 99 most popular songs on a daily basis by tracking what the web has to say. It was a perfect match for Twitter, since it was a music discovery site already built to keep track of what music listeners were talking about and sharing on Twitter and other sources. The new app, called Twitter Music, could launch by the end of this month. Various reports say that Twitter Music will suggest artists and songs, based at least in part on what a person follows on Twitter. Songs will be streamed via SoundCloud, which seems to be a perfect streaming partner. It’s easy to imagine the success that an application like this can have, given the popularity that lots of recording artists have on Twitter. Artists can offer their music on SoundCloud and spread the word on Twitter directly to followers. By the way, SoundCloud execs participate often in RAIN Summits, and we’ll be hosting one in Vegas on April 7th, and Brussels on May 23rd. The competitive landscape of online music services had a busy week, with everyone out and about in Austin at SXSW wooing press and fans. Just 3 months after announcing that they had reached 5 million subscribers globally, Spotify announced this week that they now have 6 million paying subscribers, and declared themselves the fastest growing music service ever. 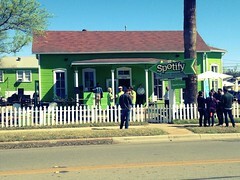 Their presence in Austin featured a house, painted Spotify green, where they hosted live bands. Rdio announced this week that they are expanding to still more countries. Their service, which new subscribers can hear ad-free for the first six months, is now available in United Kingdom, Australia, Belgium, Canada, Denmark, Estonia, Finland, France, Netherlands, New Zealand, Norway, Portugal, Spain, Austria, Iceland, Ireland, Italy, Latvia, Lithuania, Mexico, Sweden and Brazil, in addition to the US. Pandora hosted a “Discovery Den” that featured many well known artists, some of which also made an appearance at iHeartRadio‘s SXSW party. Rhapsody had a party, and hosted a panel as well: ‘Streaming Music: A River of Cash or up the Creek.’ The panel will bring together perspectives from all sides of the issue to examine what roles streaming music services can play for artists today and in the future. Hats off to them for that. There’s been a lot of talk lately about car dashboards, and connectivity, and the threat that new technologies like streaming may pose for AM/FM, which currently owns all of that real estate. For those of you who read this blog, or attend RAIN Summits, it’s not news that connectivity in cars is impacting dashboards, with more listening options available. Nearly all the car manufacturers have announced partnerships with streaming platforms. Just yesterday Volvo released news that its new connected dashboard, with a 7 inch touch screen and voice activation, will feature TuneIn and Spotify. The dashboard of the future won’t eliminate AM/FM, instead it will offer more options. Connected, interactive options that enable listeners to choose stations from a mix of delivery platforms. Streaming options alongside HD options alongside AM/FM options, alongside – dare I say it – maybe even satellite options. All-in-one dashboard players. No one (okay, maybe someone) said, or thinks, that AM/FM will be eliminated from car dashboards. The NAB would never let that happen. More than 90% of the population listen weekly. (Although, that number may drop as other options become available). There, now doesn’t that make you feel better?.. Dial Global this week announced a partnership with SoundHound that will offer advertisers more interactivity with broadcast radio listeners. SoundHound is a music app that listeners can download to their mobile devices and use to identify songs. Now, advertisers can offer listeners access to exclusive offers and branded audio, video, and Web content delivered on their mobile device through SoundHound. With this new technology, advertisers will have the ability to provide additional information to consumers via a “second screen” portable device – enhancing the interactivity of their radio campaigns. Reportedly, the consumer does not have to interact with a commercial immediately in order to tap into the “second screen” offering because the information will remain available for a period of time. As lifestyle shifts toward mobile continue, technology that enables radio campaigns to benefit are essential. eMarketer forecasts the number of mobile shoppers in the US will increase by 24% in 2013 to 118 million consumers and represent 62% of digital shoppers. Over the next four years, the overlap between mobile and digital shoppers will steadily increase as the number of mobile shoppers grows to 174 million in 2016, 80% of all online shoppers. Mobile interactivity both increases the impact of a campaign as well as the ability to quantify effectiveness. “Until now, radio has struggled to keep pace with the kind of measurable engagement offered by newer digital marketing platforms. Together with SoundHound, we have created a marketing solution that delivers trackable engagement between listeners and brands.” said Ken Williams, President of Dial Global. Muve Music, a music subscription service that is a division of Cricket Wireless, recently announced that they have more than a million subscribers in the US. Cricket sells prepaid, no contract wireless service for smartphones and cellphones. The million mark for subscribers in the US is a number that in the past year Spotify and Rhapsody have mentioned as well. Other subscription services that are a factor are Pandora, with their Pandora One service, MOG and Rdio. No one really knows how big those services are, although I’d guess that Pandora One is well over a million, and MOG and Rdio are under. Sirius XM also sells subscriptions as add-ons to their satellite music customer base. According to a recently released annual study of music sales by IFPI, the number of people paying to use subscription services grew 44 per cent in 2012 to 20 million globally. Subscription revenues are expected to account for more than 10 per cent of digital revenues for the first time in 2012. (again, that’s a global report). Subscription services are credited with replacing illegal download activity, and also with replacing music download sales. With several services in the US hitting the million subscriber mark and subscription based revenues projected to make up 10% of digital revenues for the music industry, it’s certainly become a viable business model for streaming. The upcoming RAIN Summit in Las Vegas on Sunday April 7th will feature several speakers from subscription based streaming services, including Rhapsody CEO Jon Irwin, who will deliver a keynote speech. Speakers from SiriusXM and Spotify will join panels as well. For more information on RAIN Summit West and to register, click here. See you there!